It's been awhile since I have posted here. Which do you prefer? I like the color edit all but the green truck. I have a mind to make it black, thoughts???? Greg - I'm more drawn to the color, but want some of that bottom parking lot cropped off. No idea on the black truck. 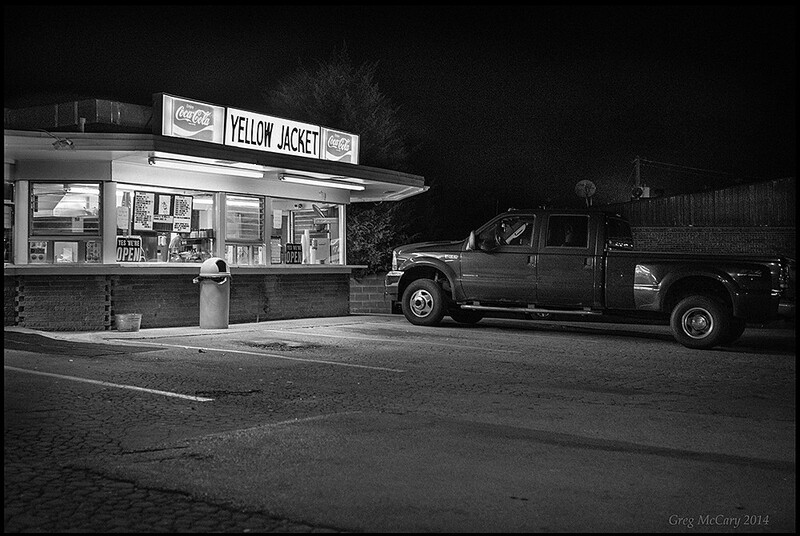 To me, the sign saying "Yellow" demands some color: otherwise, it's a letdown. The black and white's OK too, but it needs some type of filter/effect to give it some oopmf. Maybe you can add some grain? Too bad there isn't a person or two in an old outfit walking there, but the newish truck wouldn't quite mesh with that anyhow I think. B & W looks nice! I really like the photo. B&W definitely and crop out as much of the parking lot as you can. Just my 2 cents worth. Sony A77 and A700, Lots of old Minolta lenses, some Sigma lenses. I would go for colour in this photo and even lighten up the truck a touch to make the green stand out a bit more. Green and Yellow terrific combination! 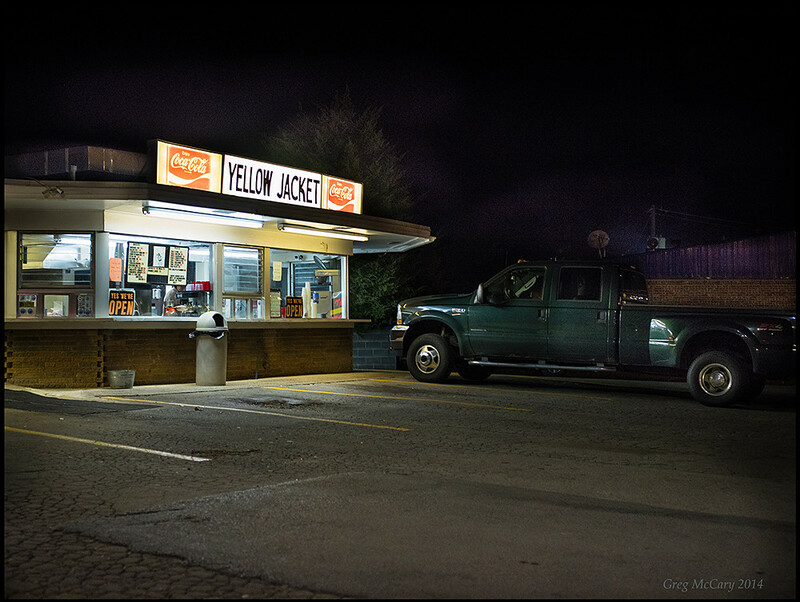 I would have cropped to the first white lane marking to emphasize the restaurant and the truck and possibly added at touch of saturation to the yellow under the roof. Even thought I am a b/w fanatic, I think the color works best here. I would crop in closer and try to do a reshoot with the counter person resting on elbows with hands hanging out the order window. An old farm truck would be a nice addition to a reshoot. Greg, I prefer color. This question re: b/w or color brings back a memory from 1955 Ft. Knox KY.
All the "troops" were sitting in the bleachers for a "familiarization class" on hand grenades. The Major was standing up front and said something to the effect as to how terrible war is, then he threw a red smoke grenade to the left, and said so make war more ????? and threw a blue grenade to the right. For his finish he threw a vivid yellow one in front of the bleachers. Plant a tree, help it grow. Children need something to climb. Critique any picture; any where; any time.